Termites are social insects that build large nests in soil, or wood and can cause damage to wooden structures. They are sometimes improperly called 'white ants'. 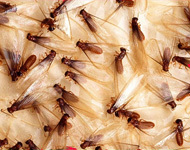 Several hundred to several million termites live together in one family. Their main goal is to work together in an organised system to find and use cellulose food source to produce a bigger colony. Within the colony there are specialised members the workers, the soldiers, the alates (reproductive males and females), the queen, king and the nursery termites. 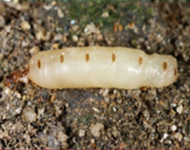 Most workers have light coloured bodies and rarely grow more that 10mm long. They are like a grain of rice. They forage for food all day and all night. They rarely leave the dark tunnels that run from the colony through the soil and into the wooden frames of buildings. They attend to the queen and her brood, nymphs and they groom and feed one another and others in the colony. Soldiers have long heads which are uniquely armoured, with powerful jaws and are responsible for defence, primarily against invading ants. Soldiers require workers to feed them. Alates have developed wings and are released by the colony to go and form new colonies. They tend to swarm on warm humid evenings. A small number survive and they mate and then find a suitable place to start a new colony. 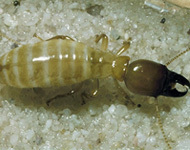 The queen is the largest termite of the colony. It can grow up to about 10cm long. In order to move, she needs several hundred workers to push her. She becomes an egg laying machine. She lays up to 1000 eggs a day. She remains in her royal chamber where she is attended to and fed by the workers, and is fertilised by the king. The eggs are removed from the royal chamber and transferred to a nursery by the workers. 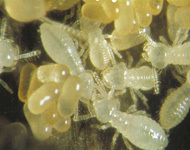 Here the brood (the eggs and nymphs) develops into other castes that the colony requires for development and survival; workers, soldiers and primary or secondary reproductives. If you have a termite or pest control problem, or simply want to gain peace of mind by getting your premises throughly inspected then contact AMAC Termite Specialists. 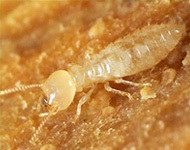 AMAC is proud to offer the Best Termite Treatment Brisbane and will service all areas for Pest Control North Brisbane.